Textiles—a heady word that encompasses cloth from all times, all places, and for all purposes. It connects everything from farm fields to Haute Couture, pre-historic peoples to glorious textured yarns spun with art batts. Every corner of the fiber-centric community that I am excited to be a part of is filled with interesting people asking interesting questions. Exploring even one textile technique or tradition can be a life’s work. And the people who immerse themselves in learning, traveling, and creating textiles tend to be passionate about sharing the object of their passion. We are so lucky that they do! 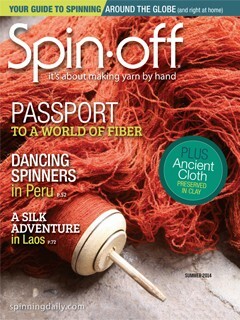 Have you seen the current issue of Spin-Off? It’s filled to the brim with world textile stories written by people driven to learn more. Ercil Howard-Wroth shares her trip to Tinkuy, Peru; Linda Ligon details thigh spinning in Mexico; and so much more. I was excited to have the opportunity to include Norway’s embroidered handcoverings in the mix. I’ve talked a bit about Norwegian handcoverings here and here, but editors Amy Clarke Moore and Anne Merrow gave me the opportunity to share more about the history of these special textiles and include a pattern for spinning and knitting your very own embroidered handcoverings. Spin-Off Summer 2014 Photo: Joe Coca. 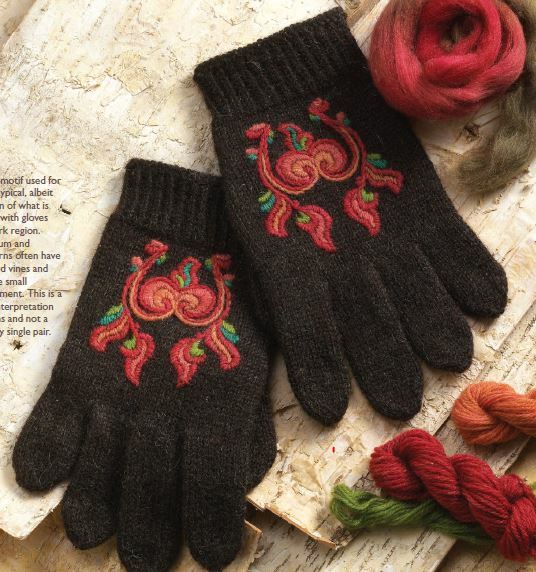 Telemark Rose Gloves by Kate Larson. The Telemark Rose Gloves combine elements of many different extant gloves from Telemark, Norway, that I have been lucky enough to see in museum collections and in print and online resources. You can browse through some of Telemark’s remarkable embroidered handcoverings in the Digitalt Museum online collection. For more information, check the pattern details on Ravelry.